President Trump's pick for the Supreme Court sought to defend his environmental record yesterday while fielding wide-ranging questions from the Senate Judiciary Committee. Brett Kavanaugh, a judge for 12 years on the U.S. Court of Appeals for the District of Columbia Circuit, came to his confirmation hearing armed with a list of cases that he says favor environmental interests. "I've ruled for environmentalists many times in big cases," he said, listing a handful of decisions involving the Clean Air Act. But many Democrats and environmentalists say the cases are misleading. They argue that Kavanaugh's overall record shows a preference for industry litigants. "Judge Kavanaugh, the thing about patterns is that there are exceptions to the pattern," said Sen. Mazie Hirono (D-Hawaii). Patrice Simms, vice president of litigation for Earthjustice, said that many of the named rulings were very narrow. "In every instance, his written opinions either side against the substantive regulatory claims that would be more protective of public health and the environment," he wrote in a blog post this week, "or he constructs legal theories that would procedurally and legally weaken public health protections over the long-term." Natural Resources Defense Council attorney John Walke argued that one of Kavanaugh's examples, NRDC v. EPA, is particularly misleading. Walke was co-counsel in the case. Kavanaugh said the ruling favored "environmentalist interests" by tossing a regulatory provision that gave cement makers an affirmative defense in citizen suits over accidental emissions (Greenwire, Sept. 5). Walke responded with a Twitter thread last night arguing that Kavanaugh's reference ignores the rest of the decision, which sided with EPA and industry intervenors on the three other claims in the suit — including NRDC's argument that pollution limits at issue were too lax. "Judge Kavanaugh rejected not one but two legal challenges to EPA's weakened pollution limits for cement plants," Walke wrote. "This was the 'environmental' crux of the case & J. Kavanaugh sided with the more polluting positions." He added that Kavanaugh's inclusion of the case in his list demonstrates "the relative paucity" of his rulings favoring environmental protections. Four Democrats on the Environment and Public Works Committee will hold a press conference with environmentalists outside the Capitol today to "set the record straight on Judge Brett Kavanaugh's long history of ruling in favor of polluters over public health." Sens. Tom Carper of Delaware, Ed Markey of Massachusetts, Jeff Merkley of Oregon and Sheldon Whitehouse of Rhode Island are slated to speak at the 2:30 p.m. event. Whitehouse is also on the Judiciary panel. Kavanaugh also briefly opined yesterday on legal issues affecting property rights and Western lands. He referenced Kelo v. City of New London, a 2005 Supreme Court case widely criticized by conservatives for its broad protection of the use of eminent domain to take property for economic development. Kavanaugh noted that the case was controversial across the country but emphasized that "it's a precedent of the Supreme Court." The judge went on to tout his own property rights record, including a 2011 opinion rolling back a Fish and Wildlife Service critical habitat designation for San Diego fairy shrimp. The California animal is "the size of an ant and has a life span of about 30 days," according to the opinion. Landowners challenged the designation. "I was just applying the statute as I saw it," Kavanaugh told Sen. Jeff Flake (R-Ariz.), "but I was trying to do it in a way that understood the concerns of landowners." He also offered a 2017 critical habitat ruling as an example of his property rights jurisprudence. In that case, he reversed a lower court decision and found that a council representing lumber companies had standing to challenge a designation that affected timber lands. "I found standing because I think it's important to understand that when something like that happens, there are lots of affected parties," he said. The first case on the Supreme Court's schedule this term deals with critical habitat for an endangered frog in the South. Environmentalists worry Kavanaugh's record doesn't bode well for the species if he is confirmed to the bench. Kavanaugh dodged another hot topic in environmental law: nationwide injunctions. The broad orders came under fire by the Trump administration after an appellate court blocked the president's effort to withhold funding for sanctuary cities earlier this year. The injunctions have also come into play in litigation over the Obama-era Clean Water Rule, also known as the Waters of the U.S. rule (Greenwire, June 19). 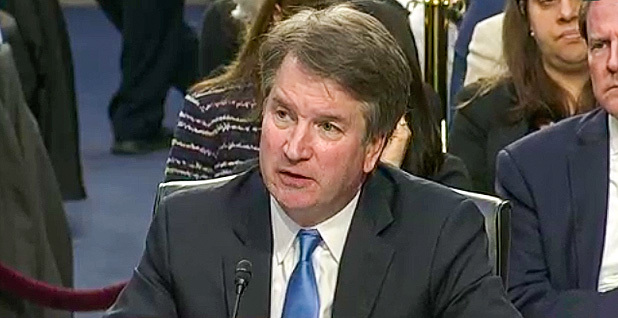 Kavanaugh declined to answer a question from Sen. John Kennedy (R-La.) on the issue, citing ongoing legal action. Senators outside the Judiciary Committee have been weighing in on the confirmation process throughout the week. Environment and Public Works Chairman John Barrasso (R-Wyo.) yesterday hailed Kavanaugh as a boon for conservatives concerned about EPA regulatory overreach during the Obama administration. "I think we will now have a majority on the Supreme Court that will go back to the wording, the letter of the law, as opposed to what they wish it meant," he said. At least two moderate Republicans — Sens. Lisa Murkowski of Alaska and Susan Collins of Maine — haven't yet committed to supporting Kavanaugh. But with the Senate Republican caucus formally returning to 51 members, Majority Leader Mitch McConnell (R-Ky.) suggested yesterday he was confident Kavanaugh would sail to confirmation. Former Sen. Jon Kyl was sworn in yesterday to fill the vacancy created by the death of Arizona Sen. John McCain, who had been absent from the Senate since December while undergoing treatment for brain cancer. "It's noteworthy that I think after all of the time that has expired between nomination and the moment we're in now, none of the votes seem to have changed," McConnell said. Senate Minority Leader Chuck Schumer (D-N.Y.) yesterday confirmed reports that Democrats had coordinated to orchestrate chaos at the beginning of Kavanaugh's hearing Tuesday. He said Democratic leadership and members of the Judiciary panel had a "nice discussion" before the hearing began about how to "show this was not regular order." "We came to the conclusion that the best thing to do was be in the room and ask repeatedly about those documents, trying to get the hearing delayed or postponed at the very beginning," Schumer said. "I think it worked out very well." McConnell, perhaps surprisingly, said he can sympathize, noting that the Senate "has been in an assertive mood" when it comes to judges over the past several decades. "I can understand their attitude about judicial appointments," he said. "What I think has been completely unreasonable is the clogging up of the entire executive calendar."